Dr. King focuses her research efforts on reducing health disparities and improving health outcomes for African Americans in the context of community-based participatory research (CBPR). 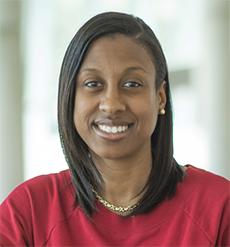 She focuses on lifestyle diseases that adversely affect the African American communities such as diabetes, hypertension, cardiovascular disease, and cancer. She is also interested in African American men’s health particularly men between the ages of 18 and 30 years old. Brown AF, Morris, DM, Kahn, KL, Sankaré, IC, King, KM, Vargas, R, Lucas-Wright, A, Jones, LF, Flowers, A, Jones, FU, Bross, R, Banner, D, del Pino, HE, Pitts, OL, Zhang, L, Porter, C, Madrigal, SK, Vassar, SD, Vangala, S, Liang, L, Martinez, AB, Norris, KC. The Healthy Community Neighborhood Initiative: Rationale and Design. Eth Dis. 2016; 26:123-132. King, KM, Pardo, YJ, Norris, KC, Diaz-Romero, M, Morris, DM, Vassar, S, Brown, AF. A community-academic partnered grant writing series to build infrastructure for partnered research. Clin Trans Sci. 2015; 8:573-578. King, KM, Morris, DM, Jones, L, Lucas-Wright, A, Jones, F et al. The Los Angeles Healthy Community Neighborhood Initiative: A Ten Year Experience in Building and Sustaining a Successful Community-Academic Partnership. J Community Med Public Health Care. 2015;2:1-8.